I’ve heard various chefs say that croissants are one baked good that it’s not usually worth making yourself as the time it takes to make them is not proportional to the improvement in them being home-made. In fact, bought ones are likely to be better. So clearly they’ve been on my to-make list for a while. I reckon there’s at least 18hrs of waiting time involved where they are proving, resting are baking. The hands on time isn’t that much though – you just have to keep resting, rolling and turning. 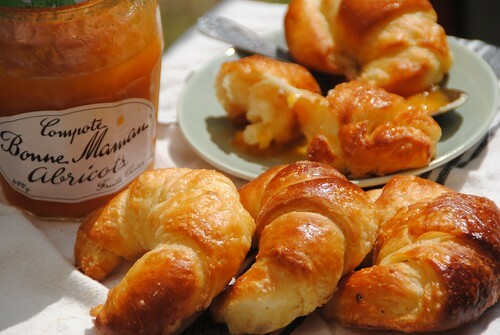 Croissants and Apricot Compote. Pass the coffee. I used the how-to guide and based the recipe on the excellent Top With Cinnamon blog. I recommend it if you are going to have a go as it uses a particularly ingenious way of making the butter layer – grating and then pressing it into shape. I also referenced Half Baked Harvest for reassurance. Whilst the butter grating idea is one of my favourite things about the TWC method, it was also my downfall. I didn’t press it down enough, so the butter broke up into the dough and left me with substandard lamination (layering) in the croissant. I still think they tasted pretty good, but Mr B’s opinion was inline with the chefs mentioned earlier. 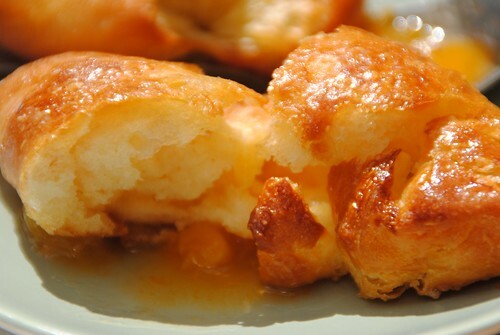 I’m tempted to have another go just to see if I can beat the croissant challenge, but it does mean a large amount of planning ahead and we all know how good I am at that…. Thanks to neighbour Viv for the Bon Maman compote – that stuff could make anything taste amazing. I may or may not have eaten some out of the jar with a spoon (don’t worry, it was that last spoonfuls before I washed the jar out). Mix the flour, salt and sugar in a large bowl. Add the yeast and stir through. Mix the milk and boiling water and pour slowly into the flour. Use a wooden spoon and then your hand to roughly incorporate it all into a sticky dough. Tip out and knead lightly for a couple of minutes until it’s evenly mixed. Place into an oiled bowl and leave to rest in the fridge for 1 hour. Take the butter out of the freezer. After 3omins take the frozen butter and grate onto a large piece of clingfilm. You want enough for a 21cm x 12xm rectangle of butter (21cm is the short side of A4) with the clingfilm folding over the top of it. Flatten the butter into the 21x12cm rectangle and pat down really really well until it’s a solid block. Wrap the clingfilm around it and refrigerate for 3omins. Take the dough out just before the butter and roll out on a floured surface into a 40cm x 25cm rectangle (A4 is 21 x 30cm if that helps you visualise it). Unwrap the butter and put it in the centre of the dough. You should be able to fold a third of the dough over the butter from each side. Just like a business letter. Pinch the edges together all the way around. Turn the dough 90 degress and make indentations with a rolling pin (see here). Roll the dough into a rectangle again and fold into thirds again. Wrap in clingfilm and refrigerate for 1 hour. This was one ‘turn’. Take one piece of dough, roll out on a floured surface to a 40cm x 15cm rectangle. Cut into thirds and cut each of these diagonally into trianglesTake one triangle of dough (I recommend putting the others in the fridge while you shape each one). For each triangle stretch the shortest edge to match the long sides, but a little slit in the base and pull it out a bit, then roll it up and put it on a greased baking tray with the top on the underside. You can also freeze them at this stage. Cover loosly with clingfilm and leave to rise for 2-3 hours or in the fridge overnight. Brush with egg wash and put in a preheated oven at 220c. Turn the oven down straight away to 200c. Bake for 10mins. Turn the oven down to 180c and bake for a further 10-15 minutes until browned. Pete made croissants once and have to admit his were super. We were watching some baking on telly and he got it into his head, started them that evening! ! I think they look great! I’ve never made croissants but they are on my one day list, I think it’s going to take a while before I get round to them though!